Moving time: 7 hr 17 min. Wind: South wind all day long. It started out at 5 mph but grew to 20 mph by the end of the ride at 4:00pm. Cross wind all day but quartering tailwind for 4 miles. Weather: 75°F (24°C) in the morning; got up to 92°F (33°C) by the end of the ride at 5:00 pm. Just like yesterday. Does the weather ever change here??? What do call it when three cars pass you in an hour? Rush hour in Kansas. I rode with Joe and Geert again for the third time today. They continue to be great to ride with. We got a slightly earlier start today than the last two days and did some good riding. It was hot and windy all day but the traffic was light and the views were great. As we climb toward Colorado the air becomes much less humid. We are slowly gaining elevation as we ride westward. Two days ago I finished at 1548 feet, yesterday at 2063 feet, and today at 2795 feet. Tomorrow I'll be over 3500 feet above sea level. It's very difficult to tell that there is an uphill grade since it is so gradual. 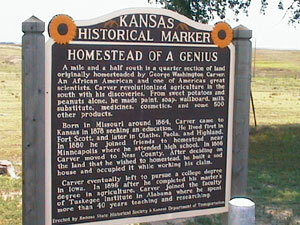 We rode through Rush Center, Kansas early in the day. Rush Center has a population of 237 and is the self-proclaimed home of the "World's Largest St. Patrick's Day Parade." I'm sure Chicago will have an issue with that. 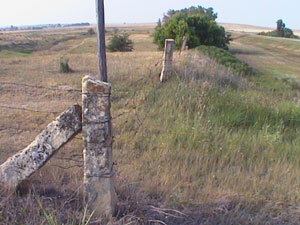 Throughout the day we saw these stone fence posts. Trees are a rare sight in these parts so farmers have to rely on other materials for fence posts. Before steel posts and electric fences became common, farmers and ranchers relied on natural materials to hold their barbed wire up. One way to solve the problem of a shortage of trees is to make fence posts out of limestone posts that weigh between 250 and 450 pounds. 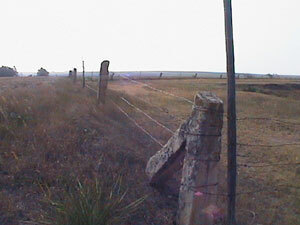 These durable posts were quarried and cut in nearby limestone outcroppings and hauled into position by horse and wagon. Some of these posts have been in position for over 150 years. 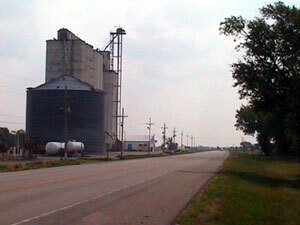 There is a building in Ness City that is called the "Skyscraper of the Prairie." 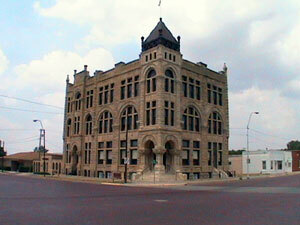 It's the Ness City Bank Building and is quite an imposing building in relationship to what is typically constructed around here. It is the first picture below. 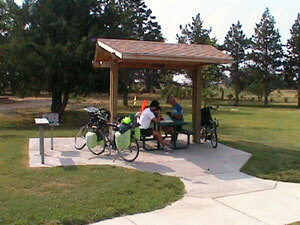 The second picture is of a roadside rest area where we found some shade and water. The water here tastes foul. All the water at restaurants, houses, rest stops, and hotels has been vile for the past four days or so. People around here drink it and they serve it at restaurants but we can't stand it. We've been buying bottled water by the gallon instead of swallowing this swill. I'm not sure what's wrong with it. For a while I considered the possibility of dissolved limestone but the water isn't hard. There are salt marshes around from time to time and Kansas has some of the largest salt deposits in North America but it doesn't taste salty. It doesn't matter if it comes from a municipal source or from a well - it's just bad. We met another rider today about four miles east of Dighton. 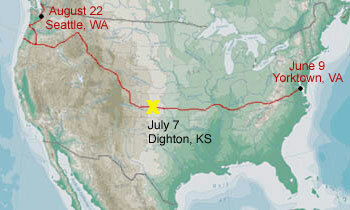 George is eastbound to Yorktown from a start in Florence, Oregon 24 days ago. He is rolling at a very good pace and has probably done quite a few century rides. His target is to do the TransAm in 50 days - far faster than most people and about 17 days better than me. I think he is staying in motels and hostels and eating out since he only has two rear panniers worth of gear. It must be nice to travel light. I listened to Car Talk and A Prairie Home Companion today on NPR. It was good to listen to something familiar again. Prairie Home was especially well suited for riding through the high plains of western Kansas. This is the life!